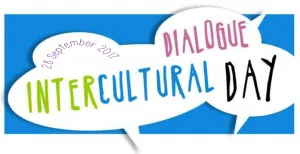 Intercultural Dialogue Day(IDD) took place Thursday, 27 September all around Europe. 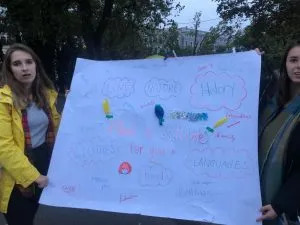 On this day volunteers organise events in their local communities to promote intercultural dialogue and to show what AFS is and what we stand for. As of this year EFIL decided to take a backseat for IDD and from now on we throw the ball over to partners to take the initiative to celebrate this wonderful day. We will still keep information and tools on our website and we encourage Partners to share with us what they did. This year AFS Latvia wrote a small article about how IDD was celebrated in Lativa. 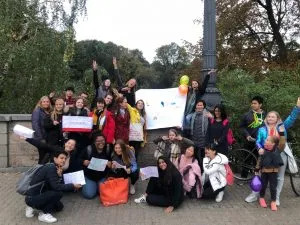 On the 27 th of September, AFS Latvia organised the Intercultural Dialogue Day for volunteers, host students, their friends and family members. The event consisted of reaching out to the community, not by having them come to us, but by us coming to them! Volunteers, host students, friends and families were first introduced to what IDD is by an interactive presentation prepared by our EVS volunteer Zehra-Astrid along with an Intercultural Quiz. After this, we all together headed off to the centre of Riga, next to the Monument of Freedom where we did various tasks. Free hugs were offered to the people of Riga along with an opportunity to write down on a big flipchart “What is culture for you?”. 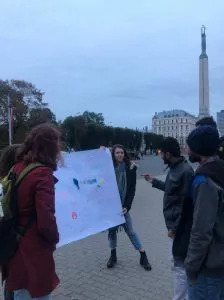 This year, we also made a contribute to Latvia as a nation, as Latvia is celebrating 100 years since it became an independent state, therefore we decided to allow the people of Riga to write “100 wishes for Latvia”.